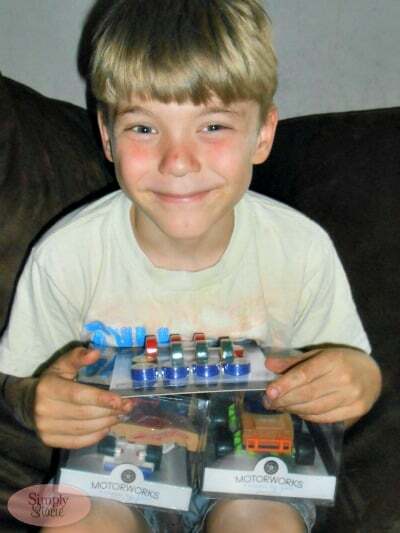 When Adam, my eight year old birthday boy opened up his new toys from the MOTORWORKS Collection by Manhattan Toy, his eyes lit up and he screamed out with excitement. 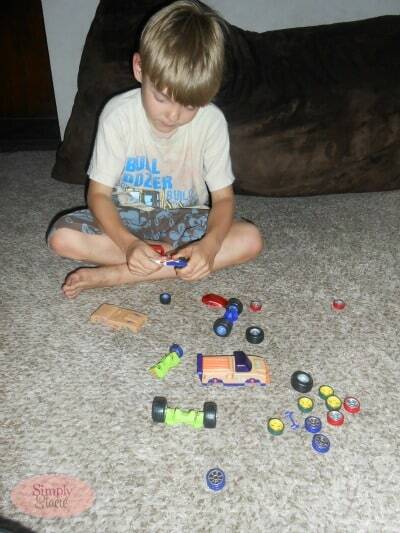 This exciting dream toy collection is perfect for children who love to build and race vehicles. The new MOTORWORKS line features toy vehicles for children ages 3 and up. 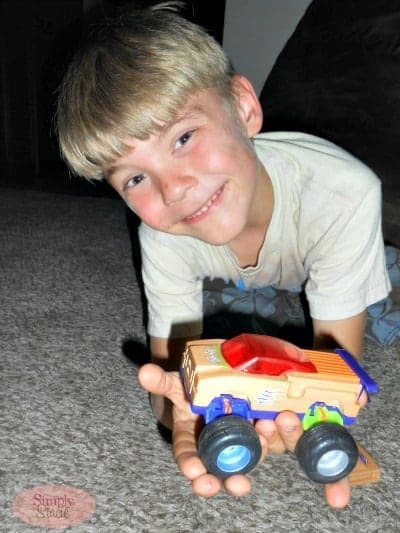 What makes this so special is that it has interchangeable parts so the child can customize each of the cars or trucks to their specifications. As I have come to expect with all of my children’s prized toys from Manhattan Toy the MOTORWORKS Collection is exceptionally made. Each vehicle has a custom, beautiful European beech wood body which has easy to snap parts and accessories. There are even additional custom accessories kits which are sold separately to make the process even more fun for young builders. My son is having a blast playing with the STX Patriot Dragster 1.0™ ($20) and the FSX Monster Truck 1.0™ ($20) which he can customize even more with the Racing Wheels 1.0™ Vehicle Accessory Kit ($10). What he likes the most is that he can mix and match the different parts to make his very own original creations. There are so many different possibilities that keep my young engineer building, taking it all apart and then rebuilding it again. After his vehicles have been built to his perfect specification, he loves to race with his siblings to see who has the fastest, toughest built car. The MOTORWORKS Collection is very impressive as there are many different cars to choose from, the vehicles are durably built to withstand many hours of play and are quite affordably priced with individual vehicles starting at $13.99 to $29.99 for a two vehicle set. You can purchase the custom accessories kits including custom car decals and monster wheels. I am planning to add to our collection for my youngest son’s upcoming birthday too with the MOTORWORKS Tuner Lift Station ($35), the FX Fire Chief ($20) and the Street Drifter 1.0 ($10). You are invited to visit the Manhattan Toy website to browse the entire MOTORWORKS Collection as well as all the other fabulous toys for boys and girls of all ages. Whenever I add a Manhattan Toy to our toy collection, I can be confident that it is made of the highest quality materials and will last for many years of fun and exciting imaginative play…..no batteries required! The Monster Truck – my boys would love it! My boys would like the MOTORWORKS GT Road Racer 1.0. I like the MOTORWORKS STX Patriot Dragster 1.0. 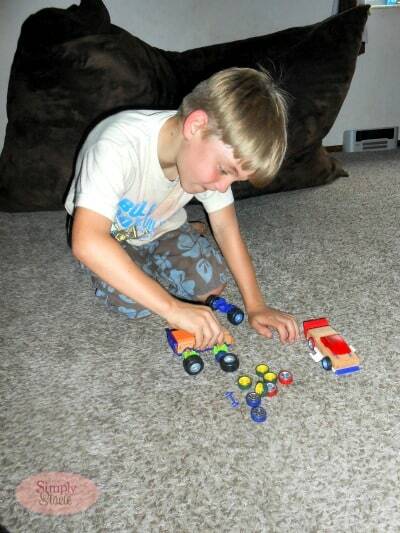 My son would have a blast with the MOTORWORKS Tri-Level Super Garage. My son would like the monster truck. the MOTORWORKS Tri-Level Super Garage. The FSX Monster Truck 1.0 with the decal accessory pack.